Last Friday Stobby and I went to a cheese fondue party. 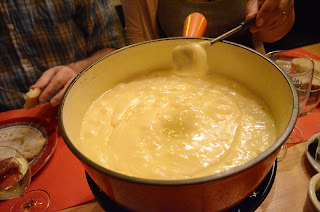 With a High Bloating Factor (HBF), cheese fondue is primarily consumed in the winter when everyone’s making love in a parka. This is my third fondue of the year and it’s only November. And despite what you may think, have no illusions, it’s just bread and cheese. When I was first introduced to this Swiss tradition I too was shocked by the lack of nourriture. Rarely is there a potato, occasionally there is dried meat, viande des Grisons, and if you’re lucky it will come decorated with pickled onions and a gherkins for…balance. We’ve had a lot of visitors come to Switzerland. When we take them out for the requisite meal we always warn them of the nature of the diet otherwise our guests pass judgment or assume we just forgot to order a side salad. Once, my brother’s girlfriend suggested the meat we were eating came from cats. She had read that somewhere. We don't warn people about the meat but we do warn them about her. Despite the unhealthy nature of the cheese fondue it is super delicious and great social event for a group. The holidays are coming and it’s a quick and simply meal that I'd recommend...at least once. * yes, the type of cheese is important. 1. Rub the inside of fondue pot with garlic. 3. Add Gruyère and Vacherin cheese melting over low heat, stirring constantly with a spatula. 5. Once the mixture takes on a creamy consistency and all the cheese is melted, put the fondue pot on its stand to keep warm. 6. Using regular forks, dip bread pieces and stir regularly to maintain the same texture throughout. By the time the cheese is consumed there should be a crusty layer at the bottom of the pot. This is called la Religieuse and is considered a delicacy. It can be scrapped off with a spatula and shared. One last note, traditionally Swiss fondue is eaten with a glass of dry white wine. Never with water…especially cool water. It brings a whole new meaning to lump in the throat.